True life – I’m a quiche addict. It’s true, I make a quiche every Sunday for my weekly breakfasts. It’s probably one of my more healthier addictions, considering the others include The Real Housewives of New Jersey, Tostitos lime tortilla chips, and cocaine (aka chocolate covered raisins). Most of my quiches are pretty simple, but none other is tastier than this caramelized onion butternut squash crustless quiche. My mornings are always crazy. Like roll out of bed, HURRY UP AND MOVE or else gremlin (the child I call mine) flips. Change diaper – check. Make coffee – check. Take dog out barefoot and braless while child claws at the door – check. Go pee while child tries climbing on my lap – check. Make hubby’s lunch (so he doesn’t go out to eat every day and spend all our monies) – check. Get flailing child’s legs into the highchair – check. Give dog a treat – check. Get child breakfast – check. Get dog breakfast – check. Feed myself – HAHAHAHA! 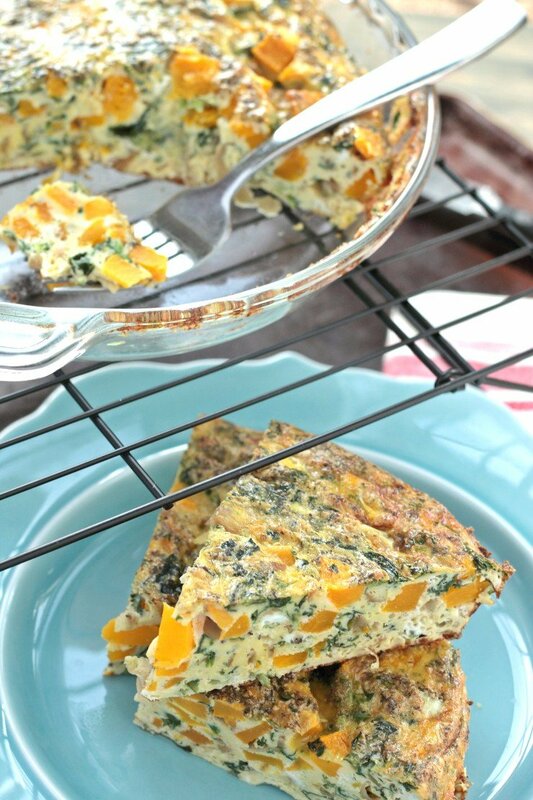 That’s why I NEED this caramelized onion butternut squash crustless quiche in my life. Not only do I go from zero to 60 in the span of ten minutes, but I need a hearty breakfast that can be easily reheated and helps me power through my morning. Quiches are perfect for just that. Aaaaaaand I usually serve them to my toddler, then give myself a pat on the back for my sneaky way of hiding all that nutritious goodness. Oooh, oooh, oooh I almost forgot to mention this beauty of a breakfast is paleo and Whole30 compliant! Packed with savory roasted butternut squash and sweet caramelized onions, the combination of flavors into this comforting egg bake is the perfect way to start your day. And it’s great for get-togethers or holiday brunches too. So here’s the dealio, I typically have a few jars of pre-made caramelized onions stashed in my freezer. Because I am addicted to them (add that to my list), and they are so easy to incorporate in a ton of breakfast, lunch, and dinner recipes. Since I have mine ready to roll, I can make this quiche in a flash. But if you don’t, have no fear – just set aside a few more minutes to make a batch of caramelized onions (doesn’t hurt to double it and freeze the other half for next week’s quiche…wink wink). Slice one yellow onion and place into a large saucepan. Add one tablespoon of olive oil and one tablespoon balsamic vinegar. Cook the onion slices on medium/high, evenly coating with the olive oil and balsamic. Once the onions start to get translucent, turn the heat to medium/low and cook until they start to caramelize, mixing frequently. This will take approximately 30 minutes. As the onions are caramelizing (or thawing if previously frozen) preheat the oven to 400 degrees, then cut 1/2 of a small butternut squash into very small cubes (1/2 – 3/4″). 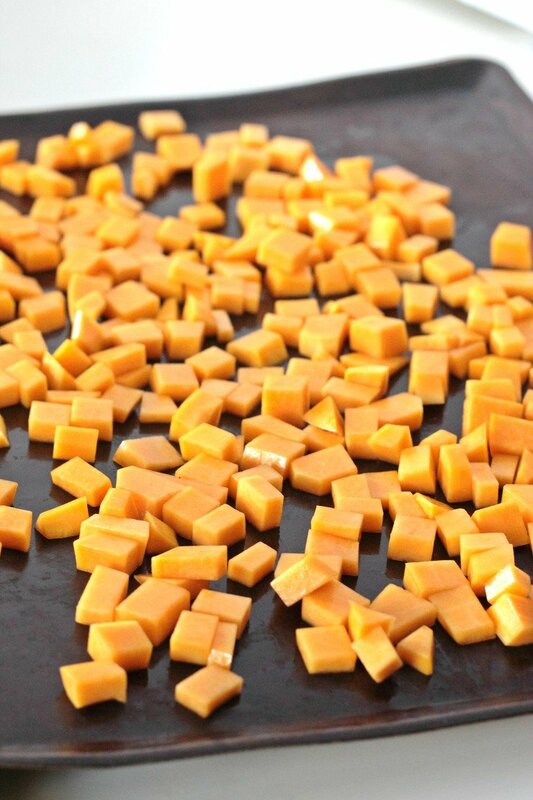 Place the cubes on a baking sheet and coat well with a few teaspoons of olive oil. Roast the squash for around 15 minutes, until the cubes start to soften slightly. Turn down the temperature of the oven down to 375 degrees. Let the squash and onions cool slightly. In a large bowl, combine the eggs, coconut milk (or you can sub for almond milk), spinach, dried herbs, butternut squash, and caramelized onions. Mix well then pour into a greased glass pie dish. Bake for 45-55 minutes or until the center is set. If you are not serving immediately, let cool them cut into appropriate serving sizes and refrigerate. When you are ready to eat, simply reheat in the microwave for roughly one minute. Cut the butternut squash and store in the refrigerator. Or cut the squash and roast it in the oven as you make the caramelized onions. Store in separate containers once cooled, then refrigerate. 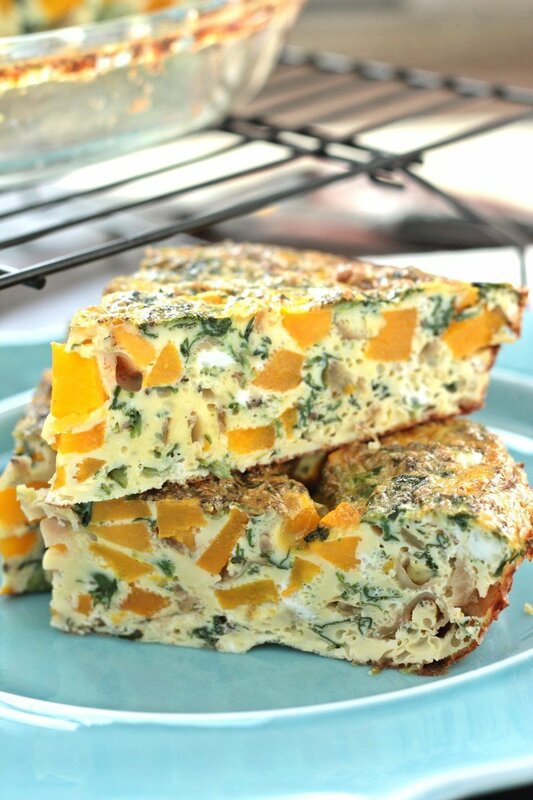 When ready to make the quiche, simply add the squash and onions in the egg mixture and bake! Caramelized onions are so good! My mom always said she liked quiches…I never had one even when I ate eggs…so I’ll never know 😛 Haha! Welp, you could totally just have a big pile of butternut squash and caramelized onions! I mean, even that sounds delicious, doesn’t it?! The addition of the sweet squash must make this taste amazing! Now it just needs some bacon…Hah! It SO is! Of course you are already on to my tricks – you’ve been doing this crazy mom act a bit longer than me 😉 Mmmmm bacon would be an amazing addition. Great idea! I’m all about meal prep to make my life easier!! You are so welcome Gretchen! Anything with carmelized onions are so tasty! This is a really nice combo for the recipe. I have never had quiche before. Everyone i speak to seems to love this. I will have to give it a try one day. Delicious and hearty!! I love caramelized onions, so I’m pretty sure I would love this! For SURE! I have no doubt Ros! I have to be honest, I’ve never made a quiche because it always seemed wayyyyy too hard. But you make it seem super manageable! 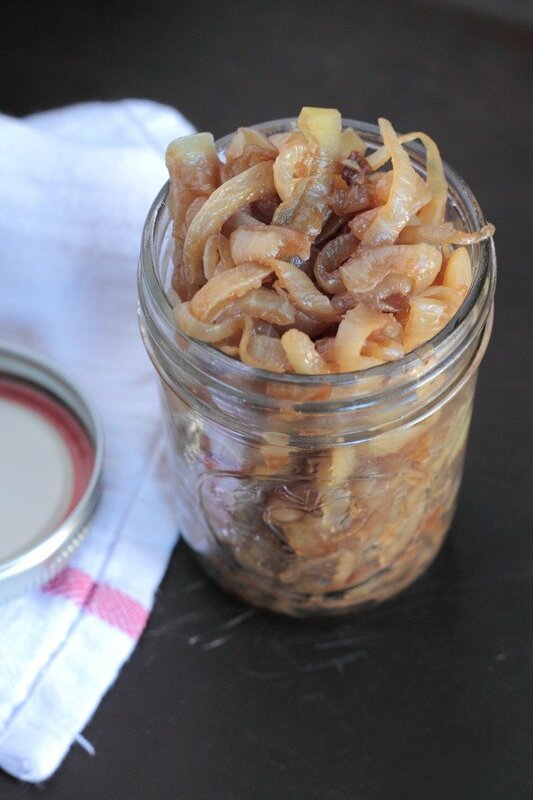 I’m with you and LOVE caramelized onions in pretty much anything! I’m pinning this for later! This sounds fantastic! I love the combo of flavors in this, and how easy it is! Yum! I have a slight love for sweeter veggies so butternut squash and caramelized onions are kind of my jam! Thanks Leah! Oh I need to make this Quiche today! So this looks amazing and I need to make it asap. And I am also LOVING your freezer carmelized onions!!! I am addicted as well and never would have thought to freeze them…yay! YES oh my gosh YES freeze those babies! It makes life so much easier and then you always have ’em in hand! Thanks Stacy. 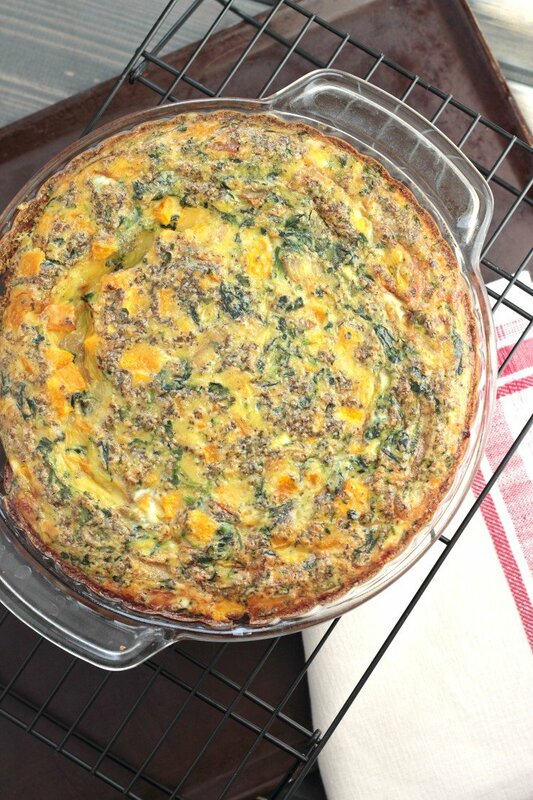 Love quiche and it seems like a long time – this recipe looks pretty simple! I pinned it for later! Thanks for the pin love Clare! It is totally simple and totally do-able! I love quiche. This recipe sounds amazing!! Quiches are da besssssst! Thanks Brittany! Thanks Klauss! Enjoy my friend. This looks amazing!! I love quiche!! and all those great veggies make it even better!! Thanks Elaine! Gotta love all those savory yet sweet elements mixed with eggs! This sounds AMAZING. Seriously. I want it so bad and I’ve totally pinned it to try later. Thanks so much for the pin love Angie! I hope you give this quiche a try! I love carmelized onions but I’ve never tried making them. This quiche looks absolutely fantastic! I feel like it could be eaten for breakfast, lunch, or dinner! Oh you so need to make them Kellen! It’s so easy! You are spot on – you totally could devour this quick for all meals. Thanks friend! I had no idea you could freeze carmelized onions, so you have just changed my life a little bit there. I love love love frittata and eggy type dishes for quick dinners, so this quiche is definitely going on my menu. Thanks for sharing! YES! It’s a game changer isn’t it?! I totally love breakfast dishes for dinner too. I hope your family loves this quiche as much as mine does Carly! Wow! This looks wonderful. I haven’t had a quiche in such a long time, but I used to love them. Caramelized onions are my jam as well – definitely want to make this for a brunch option one of these weekends. Oh I hope you give this a try Mimi! Once a quiche lover, always a quiche lover! Loving all of the colors! I must try this one! That squash just makes it sooooo pretty! Thanks Stacy. Made this today using fresh spinach. I think I should have chopped it rather than using whole leaves? The recipe doesn’t mention this detail but whole leaves made the quiche a little funny-looking. Tasted good, though! I only had regular milk, but added goat cheese. ? Very good! OMG that sounds like a delicious add!!! My husband and I are on day 20 of our first Whole30 and made this last night for breakfasts/quick meals for the rest of the week– really terrific! Perfect for this time of year and great to have another “compliant” recipe to tuck in my back pocket and bring to brunches, etc., with folks who aren’t necessarily gluten and dairy free. I truly didn’t miss the crust or cheese. I suspect if I remember to chop up the spinach in smaller pieces, my 4 y-o will be down with it, too ;). Thank you! So great to hear Elizabeth! Thanks for the note! Could this recipe be made as muffins or would it be too moist? If it can, how would you change the baking time? I was thinking muffins might be easy to grab on the way out the door if possible. Hello! I’m not sure they would work as muffins – but you could certainly try! I’d make sure the butternut squash was cut smaller than instructed. Good luck! Love this! I’d like to make these grab and go ready but doing them in a muffin tin. I know this will change the cooking time since it’s a coated pan but do you recommend cupcake liners with this or just a spray of coconut oil so they won’t stick? Has anyone else tried this and can give tips?? What about silicone liners? Those are awesome for egg cups! Hi! I’m going to make this for dinner tonight and am so excited, it looks amazing! What brand of coconut milk do you recommend? The canned kind or the refrigerated? I use So Delicious regular and unsweetened in my coffee and cereal. how long does this keep in the fridge? looks so good!